Drinking is always fun, but drinking as part of a yard game always makes the night (or day) a blast!! Here is a list of games that you can set up and play with your friends in your backyard. These are great to have on hand for all parties and really helps get that party going!They are not in any particular order because you can’t go wrong with any of them! They are not in any particular order because you can’t go wrong with any of them! Why not enjoy the outdoors and nature in your own backyard? Now you can add the next level of excitement to your family and friends gatherings with backyard games. These outdoor games are also great for events in parks, on the beach and so much more! Outdoor games can range from the size of a frisbee to a life size giant Jenga! With all of the options out there, I’m sure you’ll find the perfect ones for your next gathering! Life size games also known as giant games, yard games or lawn games are your childhood favorite games turned into giant games so you feel you are part of the game. These are always fun as you can move around while you play, others can easily watch, and it makes people want to jump in and join! The most common life-size game is Jenga, but there are so many more you probably never thought of!! Our favorite is the Giant Connect 4! A simple, easy to learn game, but super huge! We will go into detail of each giant size yard game so you can see which ones are best for you. Uniqueness – Giant games are usually unique so everyone wants to play. It helps get everyone involved and together. Sometimes though you need to take time the explain the rules or have a sign somewhere with the rules on it. Exciting – When a play is made, such as the Jenga falling, Giant games are so much larger than the tradition table games that it creates more excitement! But, that doesn’t mean that table games or smaller yard games are still not thoroughly enjoyed. Travel – The size of some giant games often make it hard to take somewhere, but this depends on the game and your vehicle. Most traditional backyard games are easy to transport and come in handy holding bags. Cost – Some giant games cost a decent amount, but the extra fun they bring and the uniqueness experience is always worth it! You surely will be bringing life to the party! 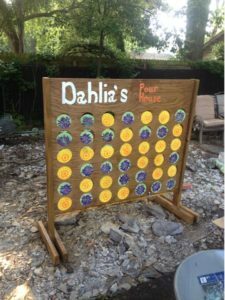 Traditional yard games are usually more cost friendly.